That's right�those "crazy" people you see standing on the ice at waters across Utah aren't so crazy after all. They know a layer of cold ice means hot fishing in the water under the ice. You can stay updated on where fishing is best in Utah this winter at www.wildlife.utah.gov/hotspots. After clicking on www.wildlife.utah.gov/hotspots, click on "Fishing condition updates for the last seven days" to get the ice fishing updates. - If you're willing to walk, you can reach any part of the lake or reservoir you want to fish. - Catching fish in the winter doesn't require the skill needed to catch fish during other times of the year. Just drop your bait in front of the fish, and wait for the fish to take it. - You don't need a lot of expensive equipment. A short rod and reel, some hooks and sinkers, wax worms or meal worms, a digging bar or an ice auger, and a large spoon or something you can use to scoop ice chunks that form in the hole you're fishing, are all you need to get started. 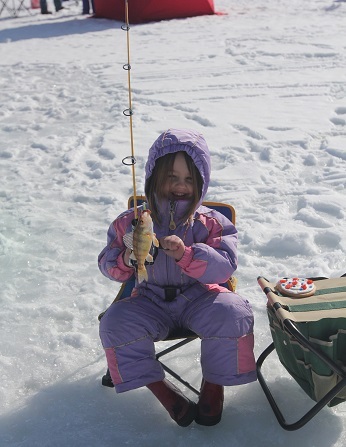 - Because you can drill two holes close together, ice fishing is a great way to double your fun by fishing with two poles. Just make sure you have a two-pole permit before you dip your second line in the water. - You can strap the ice cleats to the bottom of your boots. The cleats will give you better traction as you walk on the ice. - Ice spikes are two short pieces of metal. They're often attached by a short cord that you can drape over your neck. Next week's story will focus on the equipment you'll need to catch fish through the ice.